Your performers deserve lots of applause! 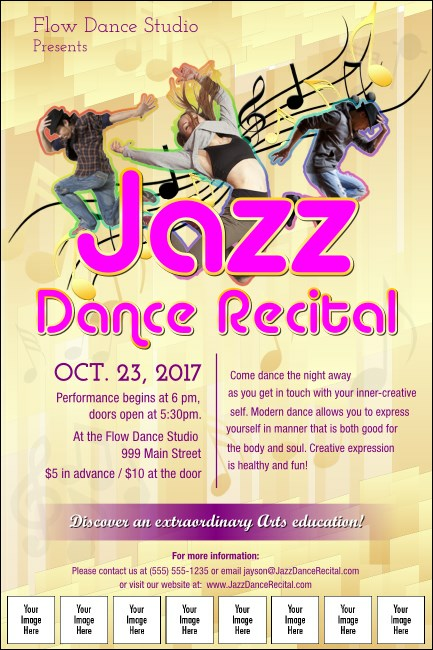 Make sure they barrel jump, lay out and shimmy to a crowd by advertising in advance with the Jazz Dance Image Poster. Topped by a swirl of music and movement, magenta typeface grabs attention and delivers particulars. Showcase sponsors or dancers using this template’s eight available image uploads. Poster measures approx. 11.46" by 17.18"
Publicize with posters that have as much moxie as your performance with TicketPrinting.com.